A group of anti-Trump demonstrators used gas canisters, rocks and bottles to assault police Tuesday night and create havoc at what officials said was mostly a peaceful protest in Phoenix. Video captured by a local reporter also shows a smoking object being thrown at police while hundreds of officers attempted to keep order at a rally after President Trump's speech at the Phoenix Convention Center had ended. "A very small number of individuals chose criminal conduct," Phoenix Police Chief Jeri Williams told reporters late Tuesday. The individuals broke down fencing and "at one point dispersed gas into and at the police officers," Williams said. "They had their own gas they threw at police, not our gas." The violence resembled the mayhem perpetrated by Antifa groups, militant far-left "anti-fascist" groups that have protested Trump at other venues. 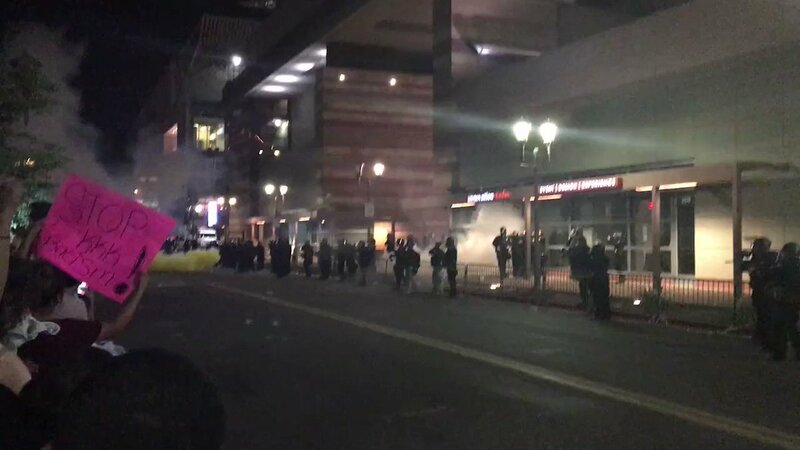 Local Phoenix officers dressed in riot gear finally had to disperse pepper balls and tear gas at the crowds. Officers first directed pepper spray at individual protesters before they deployed a larger-scale gas. "Officers were forced then at that time to really protect themselves, to protect the community, to protect property and they did so successfully and professionally," Williams said. Video recorded in downtown Phoenix shows a lit object striking a police officer outside President Donald Trump's rally. Four people were arrested in connection with the protest, and two of those were charged with aggravated assault on a police officer. A reporter with the Arizona Republic captured video of a lit object being thrown toward police officers from a crowd of people gathered in downtown Phoenix. The video shows the object begins smoking after striking a police officer. Phoenix Mayor Greg Stanton described the event as a largely civil celebration of First Amendment rights -- with tens of thousands of demonstrators -- but noted a "very small number of people" who chose to engage in "acts of assault on our police officers." Preliminary information, fourteen arrests today. Confirmed or revised total will be shared when available. Stanton said the group used gas, rocks and bottles and called the incident "very, very unfortunate." "I don't think they're affiliated with any organization," Stanton said of the individuals arrested. "Thank God no one was hurt here tonight," he told reporters, noting that two officers were treated for heat exhaustion. Similar incidents among anti-Trump protesters have been reported at other rallies across the country. Police working to keep all groups separated. Protesters should stay with their groups, not attempt to cross streets to escalate tensions. In June, an arsenal of weaponry -- including clubs, knives, bricks and what look like spears -- were seized by police in Portland, Ore., when rival political groups clashed during a pro-Trump, free-speech rally. Law enforcement clad in riot gear had to shield themselves from rocks and other projectiles thrown by anti-Trump protesters, according to local news outlets. At one point during the Portland demonstrations, several anti-Trump protesters – black-clad and masked – were seen waving an "Antifascist Action" flag at pro-Trump activists. Antifa groups have come under fire in the wake of the violence at a white nationalist rally in Charlottesville, Va. Many have said Antifa demonstrators played a significant role in the violent clashes in Charlottesville and at other events across the country. A White House petition, meanwhile, is demanding that the Trump administration officially label Antifa a "terror group." As of Wednesday, the petition had more than double the 100,000 signatures needed to merit a formal response from the White House.